Not an obscure book at all, a consideration of Hunger within its late 19th century context makes clear why it is considered an early modern classic, echoing through the literature of the century that followed. 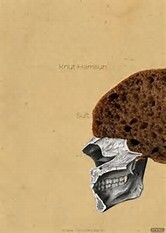 Knut Hamsun’s novel stands in sharp contrast to much that had come before: it is a plotless narrative of a destitute writer’s mental state as he pits his personal vision against the harsh realities of the outer world. Hunger and poverty weigh heavily upon him. We don’t know exactly how he arrived at this state, although there are enough hints dropped for us to know that it hasn’t been a perpetual situation. We meet the author (clearly Hamsun’s surrogate) in the midst of his troubles, but at least with a roof over his head. He is on the street soon enough, but holds optimism that a turn of fortune is at hand. He does have a tendency, if not a determination, to subvert himself – no sooner does he come into a pittance than he impulsively gives it away, or rejects offered assistance through a misplaced pride. He is prone to bouts of self-aggrandizement, alternating with periods of hopeless despair. He further swings between touching sentimentality and fierce rancor. In the streets of 21st century America, he would simply be counted among the homeless mentally ill, but the narrative is sustained by his internal dialog, and clearly there is a degree of intelligence and self-awareness being portrayed. In narrative terms, the arc of the story is a rather shallow one, and one can’t imagine too many realistic scenarios (short of violence or death) by which Hamsun could bring the tale to an end, but there is enough of a narrative to pull the reader forward. It’s considered that this story is largely autobiographical, with incidents from the author’s own years of desperation. Aside from some unsavory opinions and associations during the years of Nazi occupation of Norway, I know little of Hamsun’s life and work. 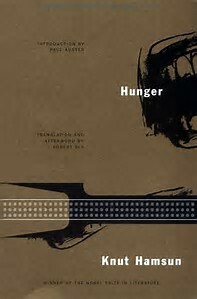 I suppose Hunger serves as a proper introduction, and I’d be curious to investigate the perspectives of his other writings.